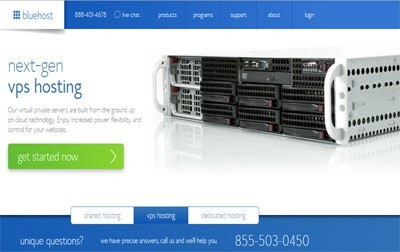 Bluehost’s VPS Plans are known throughout the industry for their extreme flexibility and top notch technical features. They offer four different plans for users interested in a virtual private server, which include the ability to choose between a Standard, Enhanced, Premium, and Ultimate package. Virtual Private Servers are generally used by large businesses and users with high traffic websites due to their versatility and security. The VPS plans offered by Bluehost go even further than that to deliver a truly enjoyable and customized experience to users. As would be expected, one of the biggest differences between the four VPS Hosting Plans is with the technical features. The Standard option has 2 CPU Cores, 30GB of SAN storage, 2GB of RAM, and 1TB of bandwidth. The Enhanced package features 2 CPU Cores, 60GB of SAN storage, 4GB of RAM, and 2TB of bandwidth. For Premium users, you receive 3 CPU Cores, 120GB of SAN storage, 6GB of RAM, and 3TB of bandwidth. Users that go with the Ultimate plan will have the advantage of 4 CPU Cores, 240GB of SAN storage, 8GB of RAM, and 4TB of bandwidth. Obviously the amount of storage and RAM are where the biggest differences are seen, as 1TB of bandwidth is usually plenty to deal with even some of the highest traffic websites. What is the Pricing Like for the Four Plans? The pricing structure for Bluehost’s VPS Hosting Plans is fairly standard for the industry, especially when it relates to the technical features that are included with each plan. The Standard Plan is priced at $29.99/month, the Enhanced plan is $59.99/month, the Premium Plan is $89.99/month, and the Ultimate Plan is $119.99/month. The first month is generally offered at half the regular price of the normal monthly fee. As usual, Bluehost also offers discounts for users that make long term commitments. Does Bluehost Offer a Money-Back Guarantee? Yes. Bluehost offers a 30-day money back guarantee for all of the plans that they offer. Obviously some of the features, such as dedicated IP addresses, will need to be purchased from Bluehost if you intend on getting your money back and keeping your IP addresses. It should be noted that you will also have the opportunity to get a prorated refund if you want your money back after the first 30 days of signing up. Are Dedicated IP Addresses Included With the Plans? Yes. Each plan includes at least one dedicated IP address. The Standard package only features one IP address while the other three plans include two. Dedicated IP addresses are important because they allow website owners to add private SSL certificates to their websites for additional security and the ability to accept online payments. Where is Bluehost’s Data Center Located? Bluehost’s main data center is located in Utah. The facility features state-of-the-art security and is considered to be one of the more eco-friendly data centers in the United States. They also have 24/7 monitoring of the facility to be sure that there are no issues with security or reliability of their servers. What Type of Uptime Guarantee Does Bluehost Offer? Bluehost does not advertise the offering of any specific uptime guarantee. Third party studies, however, have confirmed that they have an uptime of somewhere in the neighborhood of 99.9%, which is what most web hosts offer as a guarantee. You should be aware that Bluehost has had some issues with servers going down in the past. The most public incident happened in February of 2013 when the data center had an electrical transient. Bluehost was extremely transparent about the entire issue and even talked about what they were going to do to ensure that it would not happen again. How Many Domains Are Included With Each Plan? All of the VPS hosting plans offered by Bluehost include only one domain. You can, however, purchase more domains if you so choose. Do You Have Root Access to the Servers? Yes. While this is something that is generally only desirable for the most advanced users, all of Bluehost’s VPS hosting plans provide you with root access so you have complete control over the server. This is one of the main reasons that BlueHost’s VPS hosting plans are so well known for their flexibility. What Control Panel is Used? As with most web hosts in the industry, Bluehost utilizes cPanel for their control panel. They have, however, enhanced the capabilities of cPanel to better align with the special tools that are included with each hosting plan. This has resulted in increased ease-of-use for both novice and experienced users. Can You Add Storage Without Admin Approval? Yes. One of the unique perks of Bluehost’s VPS hosting packages is the fact that they enable you to purchase server expansions on the fly and without admin approval. This means that you do not have to go through any extended processes with the support staff in order to grow your website. No. Unfortunately one of the downfalls of Bluehost is that they do not offer free website transfers for most of their plans. Users can, however, pay $150/transfer to have one of their professionals handle either a manual or cPanel transfer for you. This is one of the few disadvantages of choosing Bluehost if you already have a website and are looking to change to a host with more technical features. No. It is somewhat mind boggling that SSL certificates are not included with any of the VPS hosting plans. Instead, they are optional add-on which are basically required if you plan on running an online store or accepting any type of payments through your website. Which VPS Hosting Plan Offers the Most Value? Bluehost advertises the Enhanced Plan as their most popular option and this is mostly due to the fact that it is also the best value. While it is $30/month more than the Standard plan, the fact that you receive an additional dedicated IP address along with a significant increase in storage, RAM, and bandwidth makes it one of the better deals that you will find on Bluehost. What Type of Customer Support Does Bluehost Offer? As with just about every web host in the industry, Bluehost offers 24/7 customer support to their users. This support is available through live chat, ticket support, and phone assistance. They also have a well laid out help center that makes it easy to find quick answers to some of the more popular questions that users have. In addition, they have a community forum that is generally updated with new discussions on a daily basis. At the end of the day, choosing between the four different VPS hosting plans that Bluehost has to offer is going to come down to what your specific storage, RAM, and bandwidth needs are. If you are unsure of which one best fits your current website, be sure to get in touch with their customer support staff for more specific information and advice. Technical features are powerful and easy to use. Allows you to easily expand servers without Admin approval. Provides 24/7 expert technical support. No website transfer.